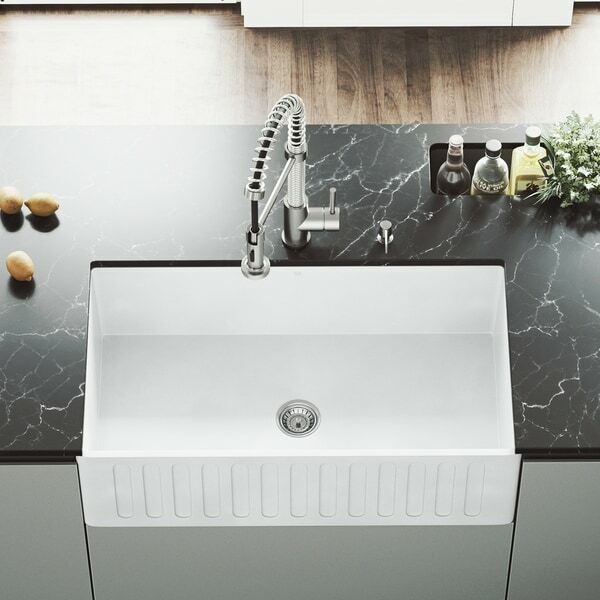 The 33 inches VIGO Matte Stone Farmhouse Kitchen Sink is constructed from VIGO's proprietary non-porous solid matte stone that resists stains, while the sink's 10mm radius curved corners are designed for functionality and easy cleaning. Choose your sink style: Install with either the slotted or flat apron on display for your modern kitchen upgrade. Includes a sink drain strainer and embossed VIGO cutting board. Dimensions 33.0 In. X 18.0 In. X 9.63 In. This sink installed beautifully and looks awesome. Until you start to use it every day. Sadly, the basin is not curved appropriately toward the drain, so washing it out Is tricky...food collects in the corners, instead of heading toward the drain. And it collects stains very easily. The only way to remove stains is to sand the surface with a fine grain piece of sandpaper provided with the sink. 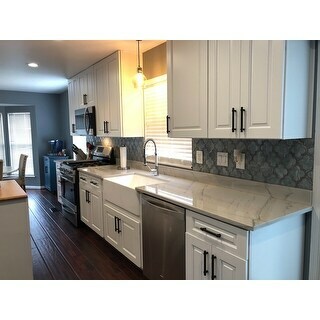 I chose this sink because it was priced reasonably and is a good brand, but considering the cost of the sink and the hassle involved with setting and mounting an apron sink, I wish I would have chosen differently, because I likely won't replace it soon. My husband complains regularly about "my sink" and how hard it is to simply clean it out. After reading the reviews on this sink I thought "to good to be true", and after recievng the sink I understand the cheap price. Read the full description, the sink isn't stone but a composite resin and stone. I was going to use the flat side, but I could see and feel buff marks, as well it is rough and un-even to the touch. Even with clean hands the exterior leaves finger prints. Return shipping for this is $***, so beware. Consider spending the extra $*** and get a good sink. Beautiful looking kitchen sink. Comes with a cutting board. The sink hole is in the middle of the sink so you can show either side of the sink. I cannot wait to get this installed. This sink is huge and beautiful! Such a fantastic price for a Farmhouse sink. And I loved that you could choose which feature to go with, the slotted or flat front. I would definitely recommend this product. As you know, farm sinks are very expensive. I searched every website and this was the least expensive with a decent star rating. My sink arrived quicker than expected. The box is very heavy so you will need a few helpers to carry it. My plumber installed it without any issues. We just had to build a brace under the sink to hold all the weight. The white is very pretty and I don’t notice any scratches or discoloration. It seems very heavy duty- won’t scratxh, chip, etc. I’m still waiting on the countertops to be installed so I haven’t actually used the sink. It’s looks great and I can’t wait to get everything else installed so I can start using it. this is such a beautiful sink, it is perfect and matches the description perfectly. Because it is a matte finish it can scuff however its an easy fix with the Magic Eraser product. Just installed and looks great. The kitchen company tried to charge me $1300 for a sink that looks just like this one. I am a bit nervous about the mixed reviews but white sinks in general are difficult to keep clean. I will update after a few weeks of use. This sink is stylish and cost effective. It looks and functions above expectations. Easy to clean and goes well with modern and traditional decors. It seemed like it'd be a perfect affordable alternative to a regular stone farm sink... however, when it arrived, it looked very cheap - more like plastic than stone. I didn't end up keeping it and decided to splurge on a real while stone sink. we are building so we have not been able to use this gorgeous sink yet. i am looking forward to using it and i have no doubts about buying it! it is beautiful...now just need to decide which side i want showing. Overstock could not figure out how to deliver this to me and then after dealing with 3 customer service representatives, I decided to return it because I can't do business with this company. 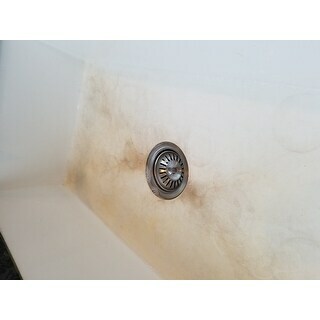 I am purchasing the sink from another company at a higher price, but hoping WAY less aggravation. I hate this sink. It stains so badly. sanding to remove stains is a pain-inefficient, ineffective and so impractical. If you have a family, stay away from this sink, it's not for real life. Great delivery and service. Very pleased with item and shall hopefully be ordering again. I'm surprised these can be delivered at this price - such great value. 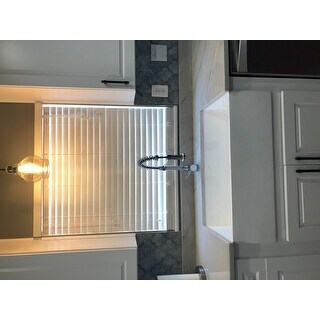 I love the simplicity of this sink and it is going to look fantastic with my new cabinets and countertops! "I want a disposal...is this an option with this sink?" "Does this sink come with a template?" This sink does not come with a template. "What is the interior measurements of the VIGO Matte Stone Farmhouse Sink - Item#: VGRA3318CS? Is there an specific protective sink grid liner for this sink? Thank you." It measures 31.625-in W x 16.625-in D. There is no specific liner required. "can I get this with a brush nickel faucet??" Unfortunately, we currently do not offer an option with a brush nickel faucet. "How much does this sink weigh?" The sink weighs 99 pounds. "Is this sink white? Or off-white?" Hello ldbaker, we try to represent the colors of our products accurately. Unfortunately, due to the difference in monitor colors we cannot guarantee that the color will match exactly what you see on your screen. In my opinion this is plain white. Thank you for shopping with Overstock!